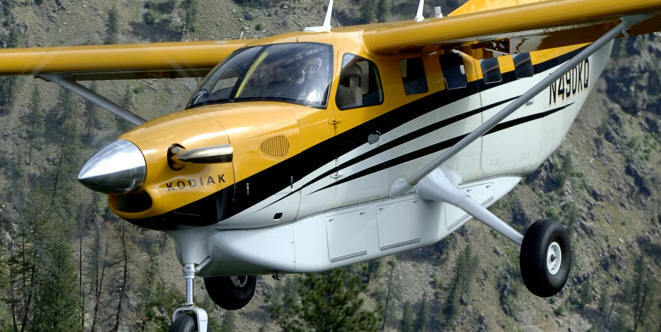 September 17, 2009, Sandpoint, ID...Quest Aircraft Company has received full unrestricted production certification for the KODIAK. The Federal Aviation Administration (FAA) presented Quest with the certificate on Tuesday, in a brief ceremony at the company’s Sandpoint Headquarters. With the production certification in hand, Quest is now able to issue standard airworthiness certificates for the KODIAK aircraft it produces. The company has been ramping up production, and KODIAKs are rolling off the line at the rate of three aircraft a month. “We’ve been very blessed over the last couple years at Quest,” continued Schaller. “We received our type certification in May 2007, just 32 months after the first flight of the KODIAK prototype. We began customer deliveries later that year and have delivered 22 KODIAKs to date. The production certificate will allow us to streamline the production and delivery process over time, as we take responsibility for inspections and coordinate changes with the FAA’s Seattle Manufacturing Inspection District Office (MIDO). The KODIAK’s rugged aluminum construction combines superior STOL performance and high useful load. It offers proven turbine reliability with the Pratt & Whitney PT6 turbine engine, is capable of working off floats without structural upgrades and has the ability to land on unimproved surfaces. The KODIAK can take off in under 700 feet at full gross takeoff weight of 6,750 lbs and climb at over 1,500 feet per minute. A 3-panel Garmin G1000 integrated avionics suite is standard equipment on the KODIAK. Quest also offers Synthetic Vision Technology for the G1000. Quest has seen strong market acceptance in key market segments, including personal use, Part 135 operations, government, and mission/humanitarian organizations. Quest Aircraft Company, LLC is the manufacturer of the KODIAK, a 10-place single engine turboprop utility airplane, designed for STOL use and float capability. Headquartered in Sandpoint, Idaho, Quest was established in 2001 and currently employs more than 300 skilled personnel.